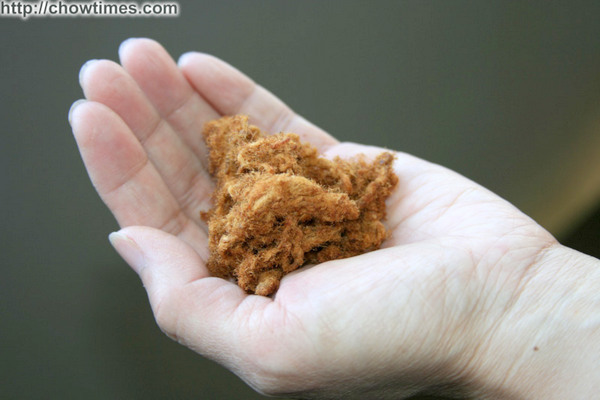 UPDATE ON 07-NOV-2009: We now have the recipe for making Pork Floss from scratch. Here is the Recipe for Pork Floss. 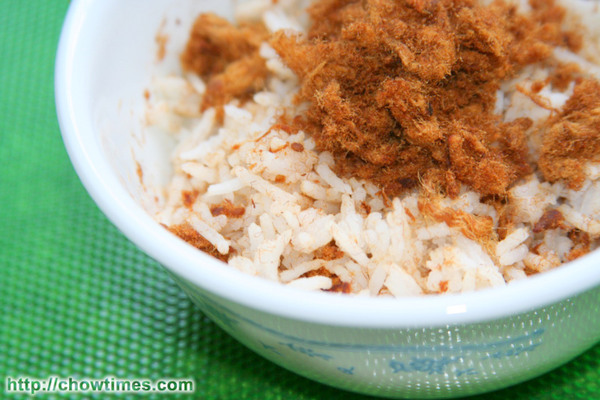 Meat Floss Shredded Dried Pork (also known as Rousong and Yoke Song in Mandarin and Cantonese respectively) is a dried chinese meat item that is commonly used as a topping for many foods. There are many variants of the Meat Floss Shredded Dried Pork with the most common one being Pork Floss. In Vancouver, the Meat Floss product seems pretty dominated by the Soo Singapore Jerky company. You will be able to find these Meat Floss Shredded Dried Pork in just about any Asian grocery stores. I believe they make Meat Floss Shredded Dried Pork and other Asian jerky products under a few brand names. Their most famous brand is Soo. We have seen the Soo’s brand getting more expensive over the year. It’s now about $10 for a jar of 454g (about 1lb). We bought a cheaper version. 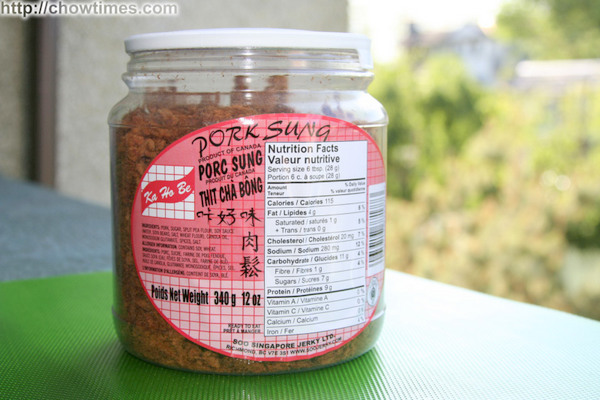 It’s branded as Pork Sung and the label said that it’s made by Soo Singapore Jerky too. The 340g jar below costs only $5.58. 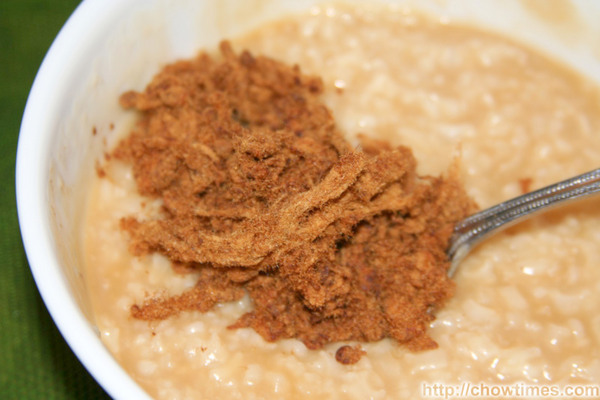 Meat Floss Shredded Dried Pork is made by stewing cheap cuts of pork in a sweetened soy sauce mixture until individual muscle fibres can be easily teased apart with a fork. This usually happens when the collagen and elastin that normally hold the fibres have been cooked out of the meat. The teased-apart meat is then strained and dried in the oven. After a light drying, the meat is mashed and beaten while being dry cooked in a large wok until it is completely dry. Additional flavourings are usually added while the mixture is being dry fried. 5 kg of meat will usually produce about 1 kg of rousong. Meat Floss Shredded Dried Pork has a light and fluffy texture quite similar to coarse cotton. It can be eaten just as a snack. It comes in soft or crisp versions. For snacking, I recommend the crisp version. Some are flavoured with sesame seed and seaweed. It goes well too with rice porridge. However, I find that the taste of the Meat Floss Shredded Dried Pork gets drowned out unless you put in a lot of it. I prefer Meat Floss Shredded Dried Pork with rice. You should use pretty dry and cold rice. Mix it well into the rice and that’s a quick meal — not very balanced though but still a nice meal nevertheless. We also make sandwiches with Meat Floss Shredded Dried Pork. 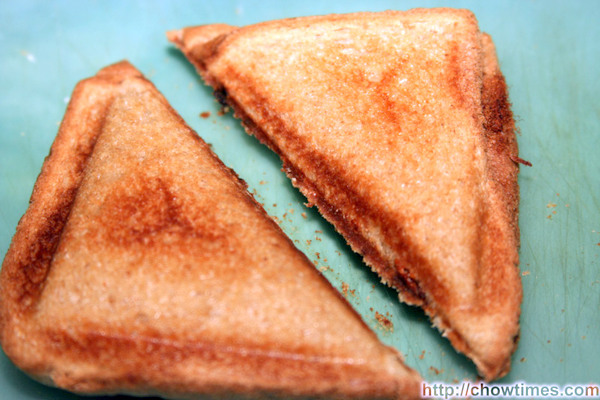 The ones below are made using a sandwich maker which helps seals in the Meat Floss Shredded Dried Pork in the sandwich. Suanne has the instructions below on making the Meat Floss Shredded Dried Pork Sandwich in the link below.